If you search for "Neasden" on this blog, you don't find stuff that's very nice. Neasden, the centre point of the borough of Brent, is kind of a byword for a poor urban environment, a crossing place of major roads and railways where amenity for the local community seems in short supply. 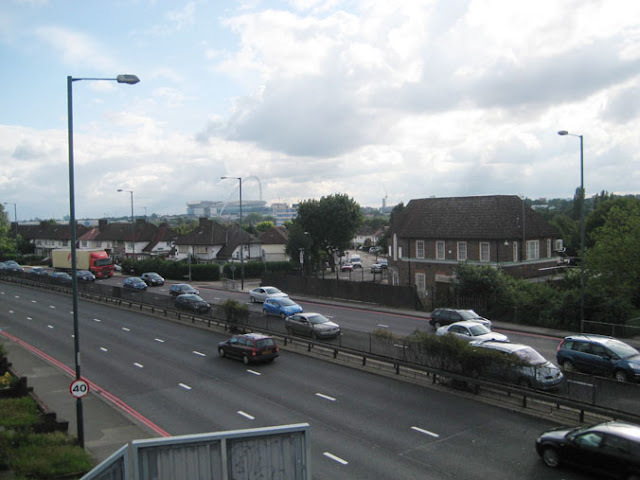 Already somewhat isolated by the 1920s by the construction of several railway lines with few crossing points, Neasden was sliced though by two stages of 20th century road-building: firstly by the building of the North Circular Road in the 1930s, which severed the area in a SE–NW direction, and secondly by the bypassing of the high street (Neasden Lane) through the construction of the modern line of the A4088 in the 1970s through a canyon which cut residential streets in half and severed the area in a SW–NE direction, leaving narrow pedestrian footbridges as the only connections. This latter was a peculiarly useless piece of roadbuilding, as a motorway-style dual carriageway section about 500 metres long that simply dumped its traffic back on to narrow roads (Neasden Lane North and Dudden Hill Lane) at either end. This stage of roadbuilding also worsened the earlier severance by the North Circular Road by removing the surface connection between the two halves of Neaden Lane and forcing pedestrians into a subway (cyclists of course were not considered at all). The stub of high street in Neaden Lane that remained was semi-pedestrainised, a procedure which works well in some places, but here just produced a neglected-looking backwater of a street full of parked cars, the car having been made the only feasible way to get around the area. The North Circular road slicing Neasden in half. The building opposite used to be a library. Brent Council have recently closed the library that replaced this one, in Neasden Lane. Though Neasden does have a possible big environmental asset in the form of the Brent Reservoir, or Welsh Harp, the open spaces adjoining this are hard to access and disconnected, and hence under-utilised. Planning seems to have gone wrong at every point in the history of Neasden. Access between Neasden and neighbouring Wembley is remarkably poor because of the lack of crossing points of the River Brent, a tiny stream, all traffic passing across an inadequate bridge in Neasden Lane North (Kingsbury Bridge) that was last widened for the British Empire Exhibition of 1923 (for which the original Wembley Stadium was built), combined with the presence of the London Underground Depot that takes up a huge swathe of land and cuts Neasden off to the south-west. Neasden also suffers from some very dirty industry which, in combination with the roads and railways, gives it the worst recorded air quality in London. What can one say that's good about Neasden? I'm sure there must be some good things that people who live there could tell us, but one thing I can say is that Neasden has long been used as a peg on which to hang humour. Usually it has been humour of a type affectionately mocking the mediocrity of an unattractive suburbia of which Neasden is taken as an exemplar. I don't think this actually has that much to do with Neasden as a place, though it might do, to an extent, as Private Eye magazine, the source of quite a bit of this humour, was originally printed in Neasden. I think it has more to do with the name. There seems to be something funny about the name (which is actually of Anglo-Saxon origin, and means "hill in the shape of a nose"). Thanks to VinylHell for putting this on YouTube. I suspect there might be a technical infringement of copyright, but it is a copyright that was not doing anybody any good, the recording being otherwise unavailable. And having it definitely increases the "gaiety of nations". And apologies to Schubert. Ha ha, yes, Penge or maybe Catford might be South London comedy equivalents to Neasden. I don't know them well, but I still suspect they are better places to cycle though.